Article 19 concerning the signage at MarketStreet was defeated at Town Meeting tonight. Thanks for all those who were able to attend. It was a good night for Lynnfield. The Annual Town Report for 2013 is now available online. Due to the size of the report, it is divided into two section. A limited number of reports will also be available in the Town Clerk’s office beginning on Thursday. Attached are the four signs that will be on 128. Not good for the long term interest of the town. More later. This is a reminder of the Selectmen’s meeting tomorrow evening where there will be discussion of the Town accepting part of Market Street so National Development can have signage on the 128 directing people to their shopping site. This is an article for Town Meeting on April 28th. Dave Basile’s letter that was in the newspaper recently best summarizes the issue. We hope you are able to attend and oppose the article. Town Meeting voters asked to accept unnecessary risk. Among the 20 plus Warrant Articles that will appear before Town Meeting this April, will be one that accepts approx. 20 thousand sq. ft. of land as a “gift” from National Development / Market Street. Essentially this gift to our Town represents the first 20 ft of roadway that is now the entrance into Market Street from Walnut St.
Before you vote, consider these questions; Why and at what risk? 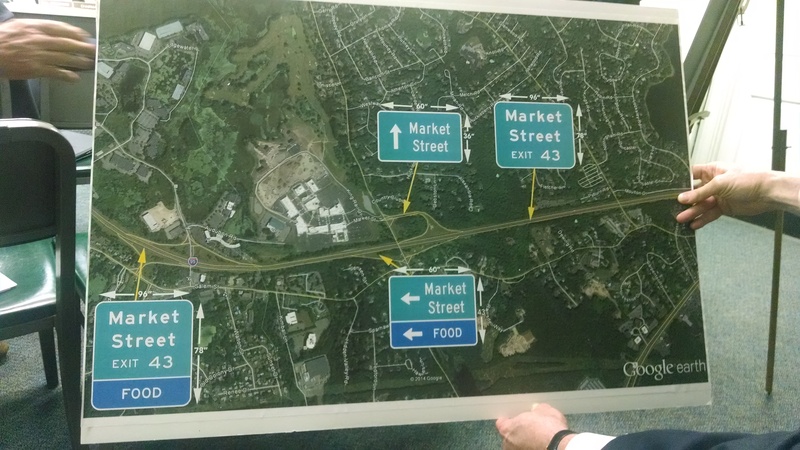 At a recent Board of Selectman’s Meeting it was alleged that this gift is to abate the problem of misguided drivers who exit 128 North via exit 43, and turn right instead of left at the light. These shoppers, having just passed the huge sign at the edge of the Sheraton Hotel property, and the new mall itself, illogically turn right at the bottom of this ramp. They are allegedly clogging the town roads off of Salem Street, as their GPS recalculates their now obvious error. This gift will correct the problem by allowing Mass Department of Transportation to permanently erect a FREE sign that points left to our new Mall directly at the bottom of the ramp. Really? Free land for a free sign, what a bargain. Why does the Town want to own 1 foot, let alone 20 feet of Market Street? Why make Market Street a public-way? Won’t we be responsible for the maintenance and care of our new 20 foot Street? Not so, say the Board of Selectmen; they promise to sign an ironclad contract with National Development, making ND and any future owner of the Mall responsible for this public-way. Really? In a litigious society is there such a thing as an ironclad agreement? What would be the unnecessary risk assumed by Lynnfield for an accident on this 20 feet of roadway, where the injured cites, say …. icy road conditions; would anybody’s attorney excuse our Town because of such a contractual agreement? For a surprisingly small annual fee, the current owners of Market Street and any subsequent owners can pay the Massachusetts Department of Transportation for a sign to be placed on state land that would direct their customers to their property; like the rest of us would do if it was our business.